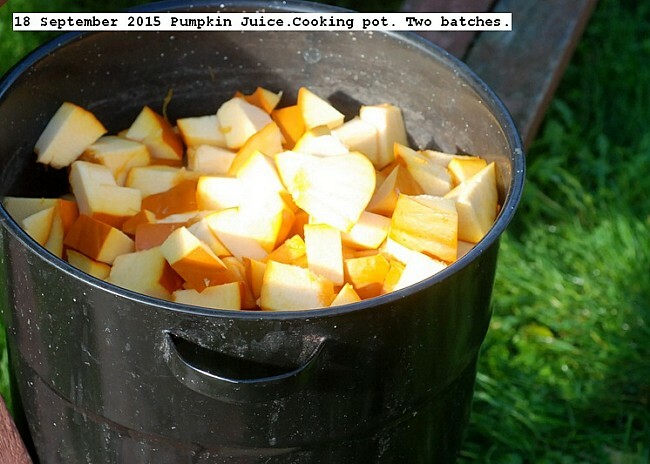 One 20 pound pumpkin was purchased locally,many pumpkins are grown in the area,and processed into 18 liters of juice. Each liter contains one pound of pumpkin.Process was to remove seeds, which were processed separately into a paste, cut into small pieces, cover with water, and cooked until soft about 20 minutes, then blend into a homogeneous slurry. The slurry was put through a food mill 2mm mesh to strain. The strained juice was placed in liter jars and pressure canned at 15 PSI for 15 minutes.There is very Little residue from the process, and straining is probably not necessary. This entry was posted in Uncategorized and tagged 18 September 2015 Pumpkin Juice, Pumpkin Juice. Bookmark the permalink.